Park Side, Toweridge Lane, High Wycombe, HP12 4DH. Guide Price £695,000. Offers Invited. An interesting and beautifully presented detached 4/5 bedroom family home of individual design bordering the West Wycombe 'Dashwood' Estate. The subject of considerable enhancement both internally and externally over the years, this unique period home will not disappoint. The property also has scope to extend above the garage 1 or 2 stories to create further living space and/or a bedroom with views across the un-spoilt parkland to the front, all subject to the relevant Planning Permission. The property has recently undergone much internal cosmetic work and benefits from new bathrooms, carpets and high quality flooring. 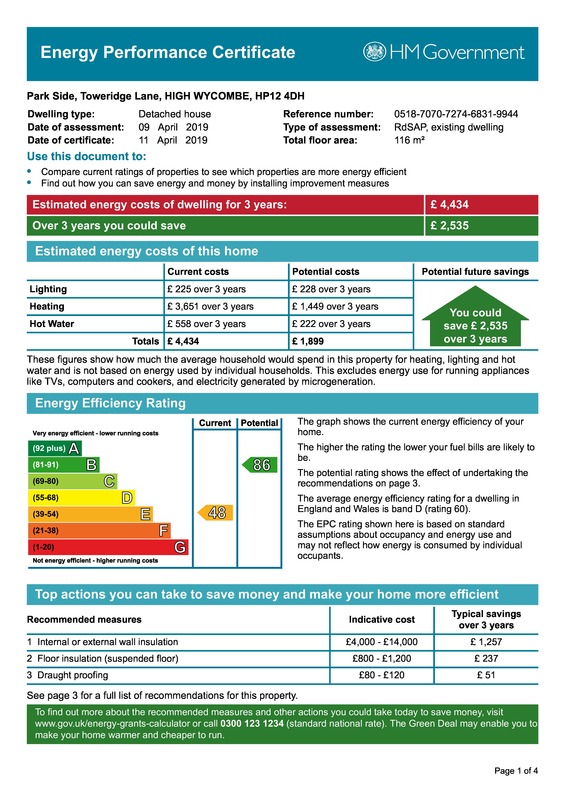 All lighting is energy efficient as the property benefits from LED and low energy lighting. Situated in an enviable location just less than a minute’s walk to National Trust Woodland and less than 5 minutes’ drive from both access to the M40 London/Oxford and High Wycombe Train Station, which has excellent rail links into London Marylebone within 25 minutes. Park Side was one of the original houses built on the land known as Toweridge Lane, well over 150 years ago. The property was owned by a retired upholsterer, and as it is well known during the 19th Century High Wycombe was famous throughout the country for its furniture and chair making. In 1983 the land of Park Side which spanned much of Toweridge Lane was sold off as individual plots. 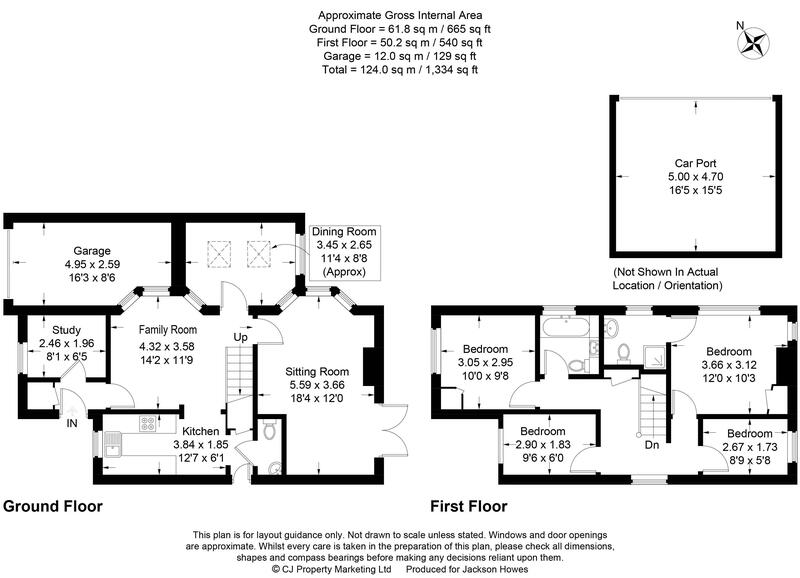 Ground Floor - Entrance hall, Study, Family Room, Dining Room/5th Bedroom, Lounge, Kitchen, Cloakroom. As you enter the property you are immediately struck by the sense of brightness and individuality of the rooms. Study: In the study, two walls are tiled in a textured stone effect which accent the room whilst still in keeping with the neutral colour pallet that runs throughout the house. Family Room: Upon inital entry to the family room, you are encaptured by the softwood cladded wall that leads all the way up the stairs to the landing area. The bay window allows the light to stream through into the room making it feel very inviting and bright. Dining Room/5th Bedroom: The dining room is also particularly striking, with the marble effect tiled feature wall bringing a different element of colour and texture into an otherwise very polished looking room. The natural light streams through the velux windows creating even more of a bright airy feel to the room. This room could alternatively be utilised as a 5th Bedroom. Lounge: A hint of luxury greets you as you enter the main lounge with double aspect windows and double doors leading to the patio/back garden. The bay window again gives a great sense of space to an already well proportioned room. First Floor - Landing, Master Bedroom with Ensuite Bathroom, Three further bedrooms, Family Bathroom. The softwood cladded wall pleasantly focuses your attention as you make your way up the staircase onto the generously sized landing area, once again you are taken by the feeling of space highlighted by the use of oak effect flooring which runs seamlessly throughtout the whole first floor. Bedroom 1 - Master with Ensuite: The master bedroom is particularly impressive being dual aspect. Fitted with a Bespoke corner wardrobe. Ensuite bathroom is well proportioned with a light and airy feel. Bedroom 2: Another bright bedroom with a window taking in the views over the large rear garden. Bedroom 3: To the front of the house a bedroom with views overlooking West Wycombe Park. Bedroom 4: Another large bedroom also with delightful views overlooking the Dashwood Estate grounds. Fitted with a bespoke corner wardrobe. Bathroom: A Contemporary styled family bathroom. Outside - Private Driveway with Detached Garage, and Double Car Port, with further parking for two vehicles all accessed via an automated dial to entry electric sliding gate. In addition to the impressive gate the other main features of the front are a stunning split-face clad wall surround with led downlights all on a timed system, as well as external power points. Cypress tress border the adjacent side of the boundary, and the steps and walkway leading up to the front door are set in Indian Natural stone. To the rear boasting one of the largest gardens on the Toweridge Lane an attractive landscaped garden can be found offering much seclusion and privacy. The main features of the garden are the continued Indian Natural stone patio and side walkway, which is enclosed by a Red Western Cedar clad wall and steps featuring led eyelid lights, leading up to a large artificial lawn area, which is very low maintenance and appealing to the eye. All bordered by very well stocked and established flowerbeds with evergreen trees, shrubs and bamboo plants which are highlighted by the led stake lights that are part of the timed lighting system also at the front of the property. There is also a secondary hard standing which currently used for a dog kennel offers much scope for a secondary seating area ideal for BBQs in the summer. The garden further extends around the corner to another large area accessed via sleeper steps which currently houses a shed, but has much potential to create additional recreational space in the way of a garden room/summer house or gym Subject to Planning Permission. Located just over a mile from West Wycombe Village, which was once owned by the Dashwood Family, West Wycombe is steeped in history and charm. In the 18th Century it was an important coaching stop on the main route between London and Oxford. In 1929 the Village was bought by The Royal Society of Arts and since 1934 The National Trust has maintained it. All in all a wonderful opportunity to acquire a beautifully presented family home steeped in its own local history and set in a desirable location in the picturesque landscape of the Chiltern Countryside. There is no onward chain and therefore the property can be available for immediate occupation. Monday to Sunday between 8 am and 9pm Subject to Availability. With over 30 years experience in Beaconsfield, Penn and the surrounding area, we're your local independent experts and we're here to help!